I think the main problem with these last few posts is the ‘favourite’ part. I have lots of movies, TV shows, books that I really really like, but by definition, I can only have one favourite. How to choose? It might be easier if I could break it down to favourite author or favourite book within a genre – fave sci-fi, fave fantasy, biography, children’s, non-fiction, romance etc etc. The way that I know that these are the favourites is that when I got rid of everything I owned and went overseas, these are the only books I couldn’t bear to part with. I still have the Narnia set that my sister stole from the Parnell Bookshop in 1985. They are beautifully crafted stories, and are equally readable by a 10-year-old or a 50-year-old. To me, this is the sign of a good children’s book. 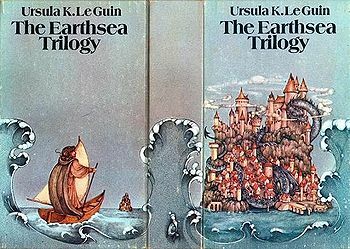 And Ursula Le Guin is one of my heroes. The daughter of an anthropologist and a writer, she writes insightfully about human nature, and builds characters with depth so that you feel like you really know them. They are the kinds of books that when you finish, you wish you could erase the memory of reading them so you can have the pleasure of discovering them all over again. And then you read them again anyway because the stories are so good. I scanned the cover but failed to attach it to this post. Rest assured, it’s very artistic with it’s big dragon flying over and the wee boat below. I agree with your thoughts on “favourites”, I have loads of favourites in every category. As far as books go, I have a core collection of about fifty books that I would never get rid of, and read repetitively. However, I can choose a favourite book… American Gods, by Neil Gaiman.